Summers are always busy for me…but this summer has been busy in extreme! Between Geoff’s schedule and mine, we haven’t found time for a traditional, go someplace, kind of vacation. Instead, we have had to grab vacation time wherever we could find it. 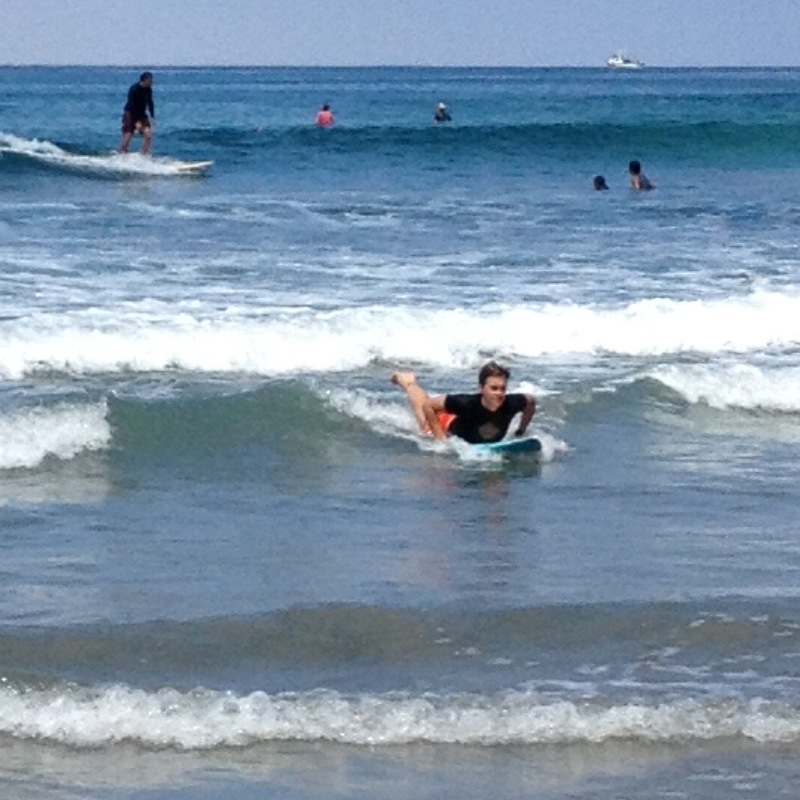 Today was one of those kinds of days…and we squeezed in a fun and relaxing one-hour vacation at the beach. It was sunny and warm today…and the ocean water was on the warm side too…perfect conditions for a summer beach walk. The marine layer stayed off the coast and we got there early enough that parking was easy! We had just had a lovely breakfast at one of our favorite local haunts and were ready to walk and talk (or not)…and as always is true of me these days, take a few photos along the way. This week’s #sdawpphotovoices theme has been curves, so I was on the lookout for curves on the beach. When we parked, the very first thing I noticed was this giant pipe on the street and immediately headed over to take a picture. I got Geoff to stand at the other end so its size would be noticeable–and I love the way the curve also becomes a frame for the portrait. As we headed down to the shoreline, the tide was approaching high. This can be a limiting factor for how far we can go, so today we headed north. The waves were small, but the surfers and boogie boarders seemed to be having great success catching the curves and enjoying their rides. Curves seemed to be everywhere. Erosion is a major issue along our local shoreline. The northern walk takes us below expensive homes that seem precariously perched above the beach. 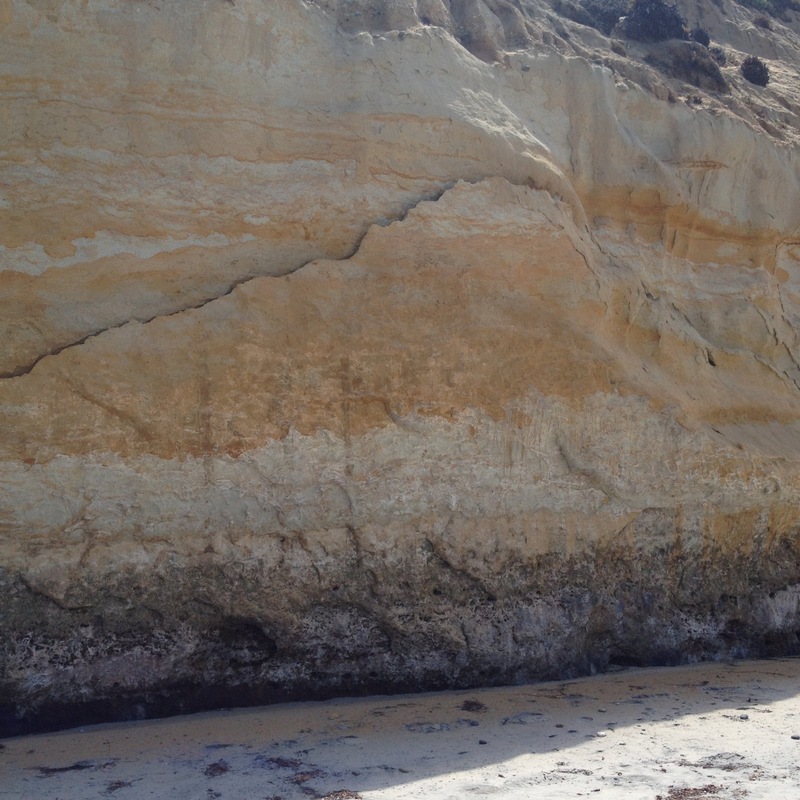 One section was still barricaded with yellow caution tape…and the crack we had seen a month ago seemed more pronounced today as it curves along the layers of sediment that make up the sea cliffs. 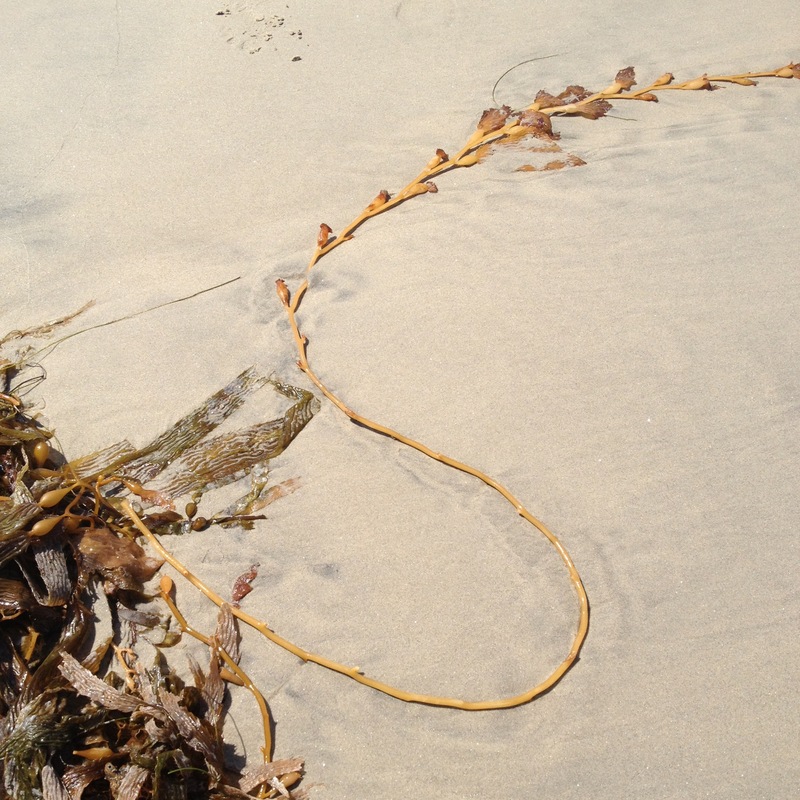 Giant kelp, which my students know by it’s scientific name Macrocystis Pyrifera, is a constant on our local beaches. Piles are evident as it washes up along the shore. Holdfasts, the rootlike structure that hold onto rocks in the water, are home to many fascinating sea creatures and we often see locals rummaging in these wet piles and finding brittle stars and tiny sea urchins hiding within and enjoying a close look before returning them to their wet and salty homes. The long stipes frequently form tangled webs although this one reached out in a gentle curve away from the rest of the pile on the sand. 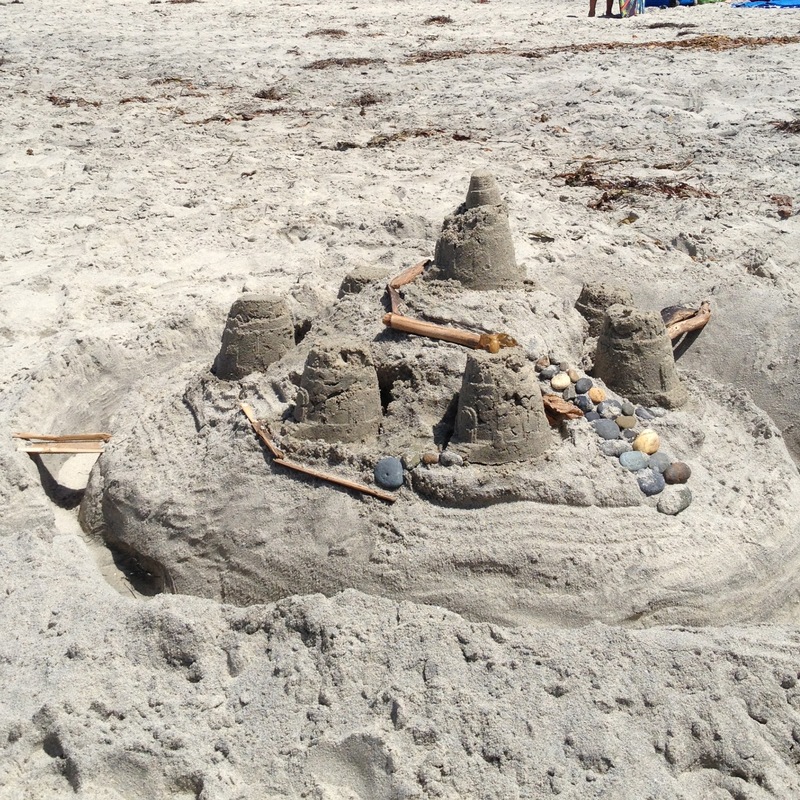 Sand castle makers have been hard at work this summer. I passed this creation and just had to stop and get close for a photo. 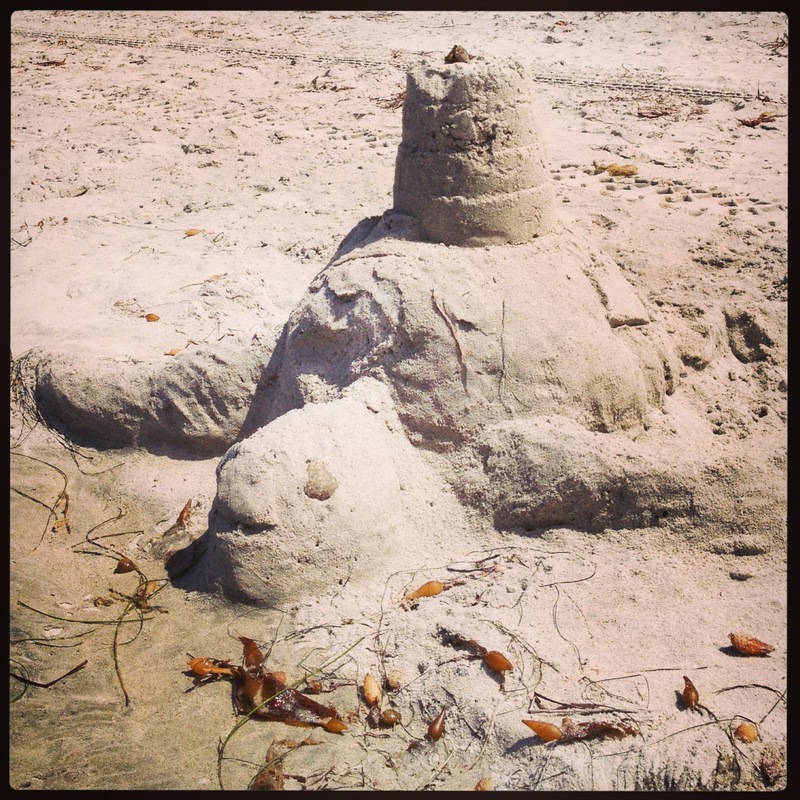 I love this turtle version of a sand castle with its curved head, shell and limbs…and the extra touch of bucket-molded sand on the top. Ocean washed rocks became eyes and the proximity of the kelp seems like a perfect touch! 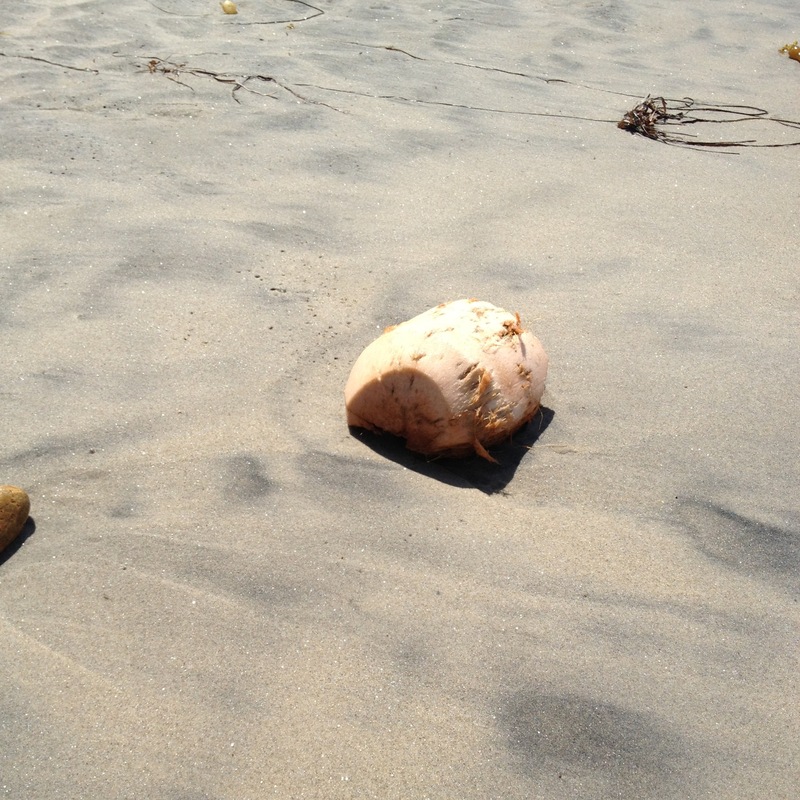 I was surprised to find this coconut laying in the surf. It had clearly spent some time being washed and worn by the sea, not quite round but definitely curved. Had me thinking of Tom Hanks in Cast Away. There were quite a few holes dug with curved banks that began to hold pools of seawater as the tide continued to rise. I took a few pictures of the water in the holes and then stopped to wait to see if I could capture the waves coming over the bank to fill the hole. I love the sense of movement this still photo captured. And then before finishing my walk, I came across another yet another sand castle. This one in more classic style with a moat, some bridges and curved turrets, and stones and shells for decoration. 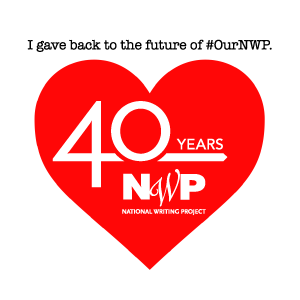 I love the way #sdawpphotovoices themes focuses my attention and helps me see familiar places in new ways. My one-hour vacation was relaxing and exotic! The photos represent only a fraction of the curves I saw at the beach…and yet give a glimpse at the variety of curves along the shore. Tomorrow begins angles…I can only imagine what I will find as I look at the world through that lens. 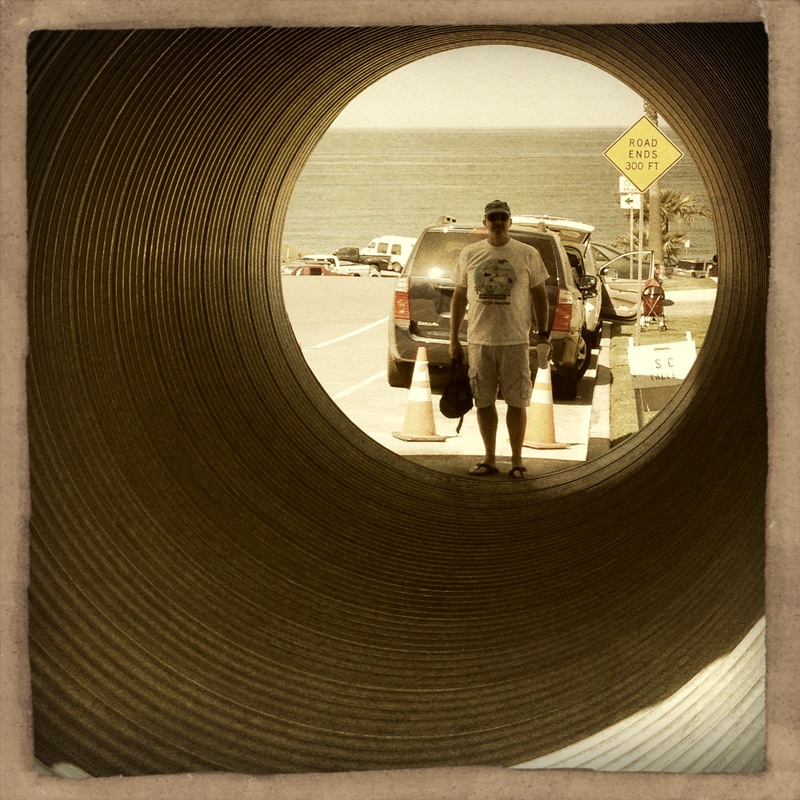 This entry was posted in nature, photography and tagged beach, beachwalk, curves, iphoneography, Macrocystis Pyrifera, one-hour vacation, photo essay, photography, sand castles, sdawpphotovoices, summer on August 11, 2013 by kd0602. 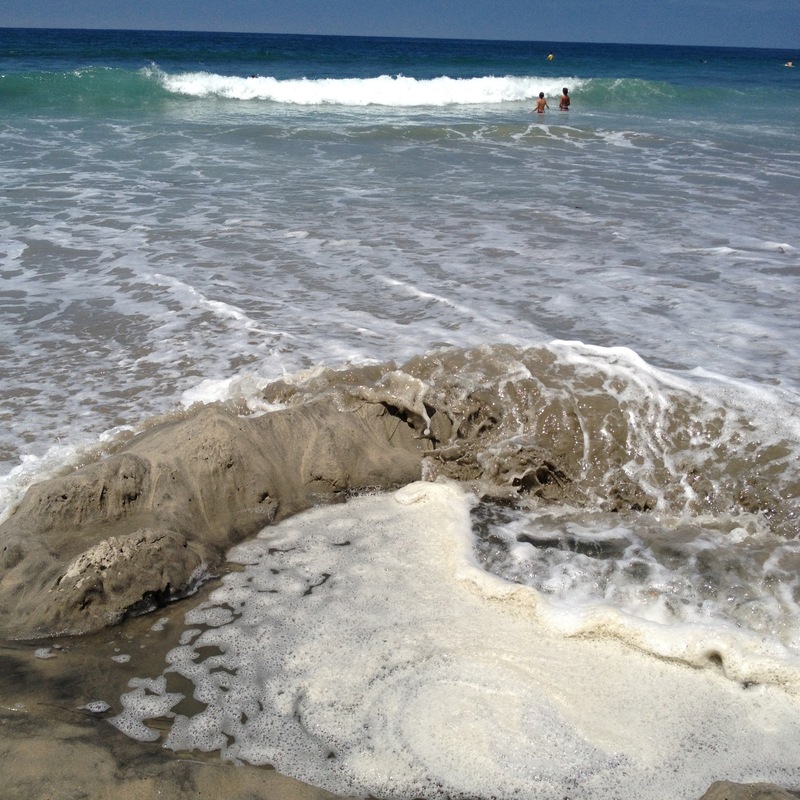 I really like the shot of the water washing into the hole on the beach. I’m wondering how often I’ve walked by one of those holes, a perfect little wave curling across it, without even noticing. Thanks for bringing these beautiful beach scenes into focus.